Growth is seen as a great thing in business – and in many cases, it certainly is. After all, if a business does not grow, it is destined to disappear in the end. All businesses start work each day with the goal of growing toward a better, and more profitable, tomorrow. However, there are tons of challenges that come along with growth, meaning that each company has to be ready to adapt as they grow if they are really going to thrive. The idea behind the Greiner Curve is that there are inevitably going to be challenges, or ‘crises’, that arise over time as an organization grows. These crises are likely to pop up between periods of steady growth, and each one will need to be handled properly if the growth is going to continue. It is possible to be stopped in your tracks at any one of the points along the growth curve, so none of these steps should be taken lightly. This curve model includes six total phases, and we have offered up a bit of information about each phase in the content below. Most businesses start out with creativity, so that is a natural place to begin. The founders of the business – whether it is just a single person, or a group of people – had a vision for the company and they are starting to bring that company to life. The staff of the business is usually small at this point in time, so decision making is easy and fairly obvious. When phase one begins to draw to a close, the organization will find itself facing a crisis of leadership. Who is going to make decisions? Is anyone currently onboard qualified to make important decisions about the future of the business? Locating proper leadership is frequently the first major crisis that is faced by a growing company. Now that good leadership has been established, the company can continue to grow – and the work that is done will usually become more formal in nature. Rather than the chaos that exists at an entrepreneurial level, companies that reach this stage will begin to lay out some defined systems that can be followed in order to sustain growth going forward. However, the company is likely now to reach a point where one person, or even a team of people, cannot make all of the decisions that need to be made. So, naturally, those decisions will have to be delegated out to various department heads and other managers. The people who actually have product or service knowledge will need to be given more control over their individual units. Growth again is spurred on now that the company has more decision makers in place, but there is also risk at this point as well. The leadership that had grown accustomed to making all of the decisions for the business will now need to step back a bit to allow the managers at lower levels to do their jobs. This can be tough for some to do, however, and the result can be conflict and confusion as to who is really in charge. With that in mind, the crisis that usually pops up at this point is one of bringing everyone together in a cohesive unit. The various divisions within the business that have been created need to be on the same page, and so too does the top-level management need to get together with those at lower levels. Successfully moving through phase three and into phase four is a big step, as companies who reach this point now have a lot of advantages working for them. With a well-organized structure in place and plenty of decision makers empowered to make choices that positively affect the company, further growth is often close at hand. However, this is the point where some businesses go ‘over the top’ in terms of structure and rules. When there is too much red tape involved in getting anything done, growth can be slowed. In the worst case, the company may even lose its way in terms of what it does best and how it thrived originally. Navigating past phase four is going to require some ‘clean-up’ of the structure that has developed in earlier stages. Many organizations will never reach this stage – but those who do should be in line for serious financial rewards. At this point the company is working together nicely from one department and manager to the next, and there are plenty of incentives to keep everyone happy. Of course, this successfully stage cannot continue to grow forever, as there are limits to all businesses when they only stick with what it is they do in house. Therefore, the last crisis on the curve is finding a way to grow through creating partnerships. Working with companies that offer complimentary products and services is likely the only growth left for a business that has arrived at phase six. Finding ways to work with other organizations so that the core of the original business is not affected will be challenging, but potentially very rewarding. 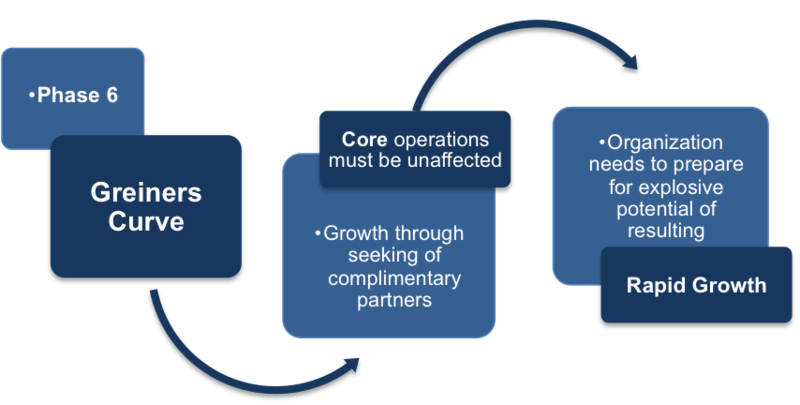 Partnerships can have explosive potential, so the company will need to be prepared for the possibility of rapid growth if a successfully partnership is established. Growth has always been, and will continue to be, a great thing for businesses. However, it is also a dangerous thing, as should be clear by reviewing the six phases above and the crises that can come along with them. If you would like to grow your organization over time, it is clear that there are several hurdles which will need to be cleared as that growth continues. Using this model is a great way to understand the challenges ahead, so that they can be anticipated and safely navigated without slowing the growth of the organization. The idea behind the Greiner Curve is that there are inevitably going to be challenges, or ‘crises’, that arise over time as an organization grows. Greiner suggested that businesses underwent six distinct phases as they grew, each precipitating a crisis at which a revolution in thinking and approach was required to progress to the next stage. Growth through creativity. 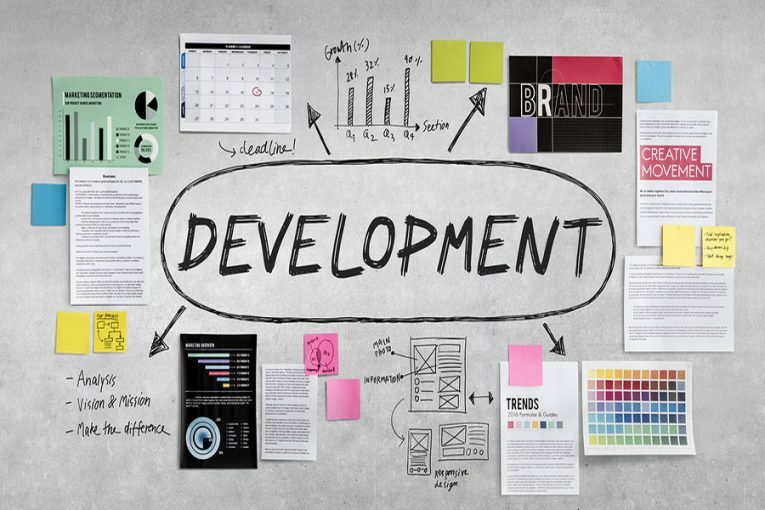 During this phase business owners will communicate with customers and react to their demands. This phase is brought into crisis by the need for professional management. Growth through direction. During this phase the new leadership team will start to steer the business while a new tier of management is put in to deal with specific functions of the business. This phase ends with lower level management requiring more autonomy and involvement in decision making. Growth through delegation. This phase comes into crisis as the executive feels like it is losing control over the lower tiers of management. Growth through co-ordination. The necessary bureaucracy that this phase entails leads to resentment from both higher and lower tier management as procedure stifles creativity and autonomous problem solving. Growth through collaboration. There are limits to all businesses when they only stick with what it is they do in house. This phase ends with a crisis of identity as further growth becomes possible only through alliances with external organisations. Growth through Extra-Organizational Solutions. Finding ways to work with other organizations so that the core of the original business is not affected will be challenging, but potentially very rewarding. Developing an understanding of why periods of growth can quickly precipitate a crisis can give you an appreciation of why businesses sometimes fail even when seeming outwardly to be successful.